Language is a key marker of membership of an ethnic group. Language allows communication of values and beliefs of a particular culture and allows participation in family and community life. The majority of Australians speak English as a first or other language, however a significant number of people also speak languages other than English. About 73% of Australians speak only English at home. While English is the dominant language in Australia, many people speak a language other than English within their families and communities. This linguistic diversity is an asset for Australia and makes us more competitive in trade as well as fostering international ties and cultural exchange. Collectively, Australians speak over 200 languages  . Of these, over 50 are actively spoken Australian Indigenous languages. About 21% of Australians reported speaking a language other than English at home. 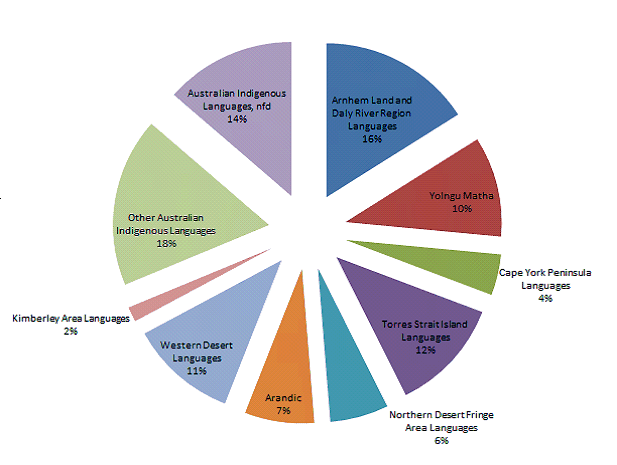 Australian Indigenous languages are spoken by less than 1% of the total population. The most common languages other than English are: Mandarin, Arabic, Cantonese, Vietnamese, Italian and Greek. Collectively, Chinese languages (including Cantonese, Mandarin and other Chinese languages) have the greatest number of speakers after English, accounting for approximately 4% of the total population. 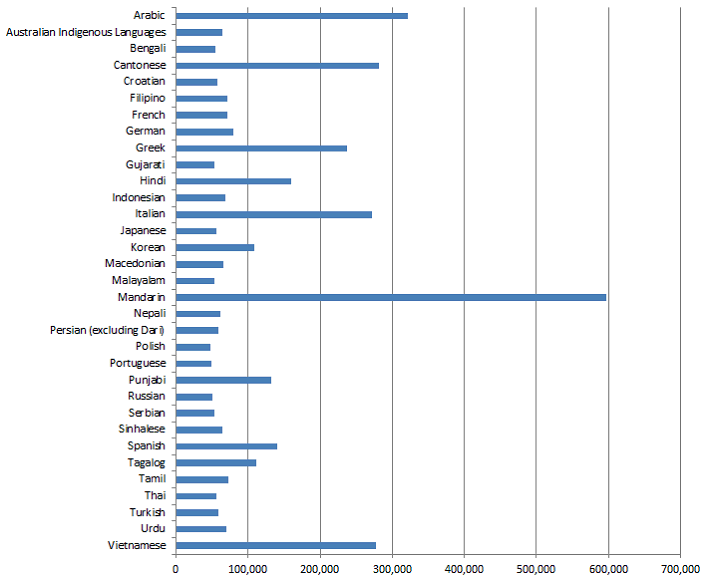 The languages other than English spoken at home vary between the states. At the time of European settlement, there were an estimated 250 languages spoken by the Indigenous people of Australia. These languages were made up collectively of a total of about 500 different dialects. Since European settlement many Indigenous languages and dialects were lost as speakers died or instead learned to speak other Indigenous languages, English or creoles. Creoles are pidgin languages which develop as the primary language of a community. Australian creoles combine English, Indigenous languages and other languages. Today, over 100 Australian Indigenous languages including creoles are spoken. Some of these languages have very few speakers. About 50 of these languages are actively spoken with 150 speakers or more for each language group. Almost 64,800 people speak an Indigenous language. A significant number of people speak an Australian creole including Yumplatok (Torres Strait Creole) (6,200 speakers) and Kriol (Australian Creole) (7,200 speakers). Around 650 people indicated that they speak Aboriginal English. Other Indigenous languages with large numbers of speakers are Djambarrpuyngu (4,300 speakers), Pitantjatjara (3,100 speakers) Walpiri (2,300 speakers) and Tiwi (2,000 speakers). The most common Indigenous languages differ between states and territories reflecting the origins of particular Aboriginal groups and their continuity with their traditional lands. Over half (60%) of the Northern Territory’s Indigenous population speak an Indigenous language, by far the greatest proportion of any state or territory. Around 13% of Indigenous people in Western Australia and 10% in South Australia speak an Indigenous language. The Northern Territory has over half (54%) of Australia’s Indigenous language speakers, with most of the remainder in Queensland (21%), Western Australia (16%) and South Australia (5%).